One word, WOW! I thought by getting up early this morning I would beat the crowd and get to TDF Open House just before it opened. Early, yes! Beat the crowds, no! The hype about the open house lived up to everything that I thought it would be, and most of Melbourne that seemed to have visited agree. For those who are not aware The Design Files Open House is the brain child of Lucy from The Design Files and Ester from the Project Agency. Together they have put together this mammoth pop up shop for 4 days only in the back Streets of Fitzroy, Melbourne. I got there just before 10am and like me, there were about 10 eager beavers waiting out the front with the same intention of getting in early. The roller door went up and I went in. Upon entry I didn't know where to look, there was something on every wall, nook and shelf! I was in heaven. The home is a warehouse conversion. Everything on the floor was up for sale, I mean everything! (Yes, even the kitchen sink!) The house had a master bedroom, ensuite, kids bedroom, dining room and garage downstairs. Upstairs was an open plan kitchen, meals and lounge area. Also upstairs was an outdoor terrace with furniture from Jarden and a coffee and sweets stand (which I bypassed as I am saving my sweet tooth for my Monthly Macaron post next week). The influx of people made it difficult to take a lot of pictures but here are some snapshots I took on the trusty iPhone using instagram. The A-frame letting you know you have found TDF Open House. If was a great Sunday morning to visit. 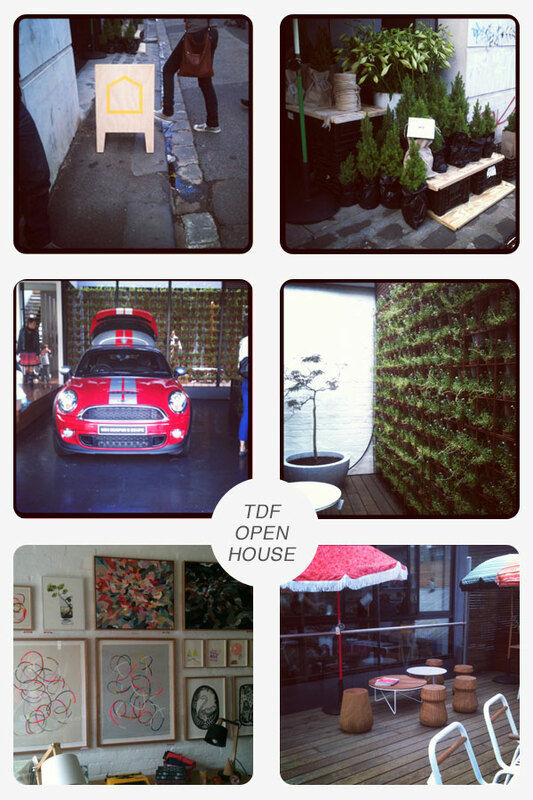 For those who didn't get down there, never fear TDF Open House are going online as off tomorrow. So you can buy anything that was in the house, with guaranteed delivery before xmas (I am pretty sure that will be only for domestic Australian delivery). So Did Lady purchase anything you may ask? Well, as much as I wanted the vintage Bally poster from Galerie Montmarte that was in the Kids Room. I walked away with The Design files 2012 calendar and Conversations with Creative Women.